Rottweiler Characteristics: The strong-willed and courageous Rottweiler is a breed of Medium to Large dog classified as a member of the Working Dog Group (AKC:1931). The Rottweiler, is characterized by its big, powerful, muscular, predominantly black appearance with tan markings, a straight back, broad, deep chest and a determined expression. Other characteristics include dark brown, medium sized, almond-shaped eyes; triangular shaped, pendulous ears and a determined, trotting gait. The temperament of the Rottweiler can be described as Fearless, Protective, Alert. The coat type of the Rottweiler is described as glossy, smooth coat in assorted colors. Due to its characteristics and qualities, the Rottweiler demonstrated the desired traits of a Watch dog, Herder, Hunting and Military Dog and is known by its nick name the "Roman Military Dog". The origin of the Rottweiler dog breed was in Germany where it was developed in the Ancient Times. There are Limitations of ownership of the Rottweiler in some USA States. Rottweiler Breed Group and Dog Type - Working Dog Group (AKC:1931): The Rottweiler is one of the many breeds of dogs that belong to the Working Dog Group (AKC:1931). Other names for the Rottweiler: The Rottweiler is known by the nickname of the "Roman Military Dog". Other names for this breed of dog include the Rottie, Rott, Rottweil Metzgerhund and the Butcher's Dog. Origin of the name: The name 'Rottweiler' derives from from the German town of Rottweil in southwest Germany which is located between the Black Forest and the Swabian Alps. Rottweiler History and Origin: The country of origin of the Rottweiler breed was in Germany during the Ancient Times. The Rottie is known by its nick name the "Roman Military Dog" because it travelled across the Roman Empire with the army and was used in the role of a sentry, on patrol duties, as trackers and to protect and control livestock. The Roman armies used the Rottweiler to drive cattle brought by enemies and invaders. The powerful, intimidating dog was also taken into battle and used in combat. The dogs wore armor and protective spiked metal collars and were arranged into attack formations. Due to its strength and ferocity the Rottweiler was used as a fighting dog and fought in the Roman arena's, such as the Colosseum, against exotic wild animals and even gladiators. The Roman's dog spread across the Empire and were interbred with local cattle dogs. The town of Rottweil in southwest Germany founded by the Romans in AD 73 as Arae Flaviae. Rottweil was known for its many drovers and livestock-trading and the Rottweiler was named after the town. The versatile Rottweiler was used across the centuries for a variety of different duties that included herding and driving cattle and for hunt bear and wolves. Their connection with livestock continued and they were also used pull carts as butcher's dogs, a cheaper alternative to a horse - hence his nickname the "Butcher's Dog". The Rottweiler was also believed to be cross bred with the now extinct Bullenbeisser dog - its name meant "bull-biter" in German. It is therefore likely that the ancestors of the Rottweiler was also used for bull baiting contests in the Medieval era. Its involvement in blood sports did not stop there as the tough, fearless was also involved in dog fighting. However, the main duty of the Rottweiler was always cattle droving but with the advent of the railways in the 19th century, cattle droving was forbidden by law and the Rottweiler nearly became extinct. In 1899 the International Club for Rottweiler Dogs was formed in Germany to safeguard the breed and the first breed standard for the Rottweiler was produced by the club in 1901. The Rottweiler was exported to the UK and the United States and the Rottweiler breed was officially recognized by the American Kennel Club (AKC) in 1931. Rottweiler Modern History: The modern history of the Rottweiler moved on and the breed is now used as a Watchdog, Herder, Military and police dog. The Rottweiler is ranked as Number 9 in the Smartest Dog List. This dog can be dangerous and there are therefore Limitations of ownership of the Rottweiler in some USA States. Rottweiler Height: The Rottweiler breed is classified as a Medium to Large sized dog. The height to the shoulder of a male dog is 24-27 inches (61-69 cm). The height to the shoulder of a female dog is 22-25 inches (56-63 cm). Rottweiler Weight: In this medium to large sized dog, the weight of a male Rottweiler dog is 95-130 pounds (43-59 kg). The weight of the smaller female dog is 85-115 pounds (38-52 kg). Rottweiler Coat Type: The coat type of the Rottweiler is described as glossy, smooth coat. 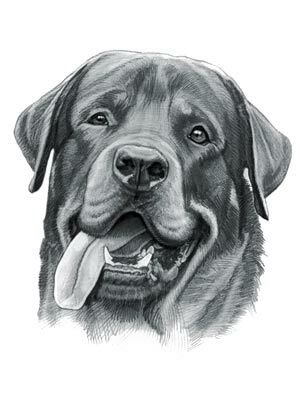 Rottweiler Coat Colors: The colors of this dog breed consist of assorted colors consisting of Black, Tan and Mahogany. N.B. Mahogany is a strong reddish-brown color. Rottweiler Grooming - LOW Grooming Needs: The dog grooming needs of the Rottweiler are categorized as Low in order to maintain a healthy coat and reduce the risk of skin infections. The limited dog grooming needs of the Rottweiler are therefore considered to be low maintenance, requiring limited attention to grooming with casual brushing and combing. Dog Grooming needs should also include bathing the dog on a monthly basis and making regular inspections of the eyes, ears, nails and teeth. Rottweiler Litter Size: The litter size of this dog breed ranges from 8-12 puppies. Rottweiler puppies for sale can be obtained reputable breeders and from rescue centers. The cost of Rottweiler puppies varies depending on location, pedigree history and the dog breeder. Rottweiler Temperament and personality: The temperament and personality of the popular Rottweiler dog breed is described as Spirited, Fearless, Protective, Alert and Courageous. Rottweiler Exercise Requirements: The exercise requirements of this breed of dog are moderate. The Rottweiler requires regular daily exercise consisting of about one to two hours every day. This medium to large sized dog has a determined, trotting gait with strides of a moderate length. Rottweiler Diet: A fully grown Rottweiler should be fed twice a day. A diet consisting of a premium dog food can be balanced with fresh food eaten by the family. The question is What Can Dogs Eat?. Check out our comprehensive list of what dogs can and what dogs cannot eat. Rottweiler Health Problems: Potential health problems of the Rottweiler breed include Elbow Dysplasia, Entropion, Gastric Torsion. Resolving health problems can prove to be expensive and it is always wise to obtain pet insurance or dog health insurance when buying a dog. Is the Rottweiler dog breed said to be Hypoallergenic? Answer: No. Rottweiler Lifespan: The life expectancy of dogs vary according to the size, breed of dog and any serious health problems. The typical lifespan of the Rottweiler breed is 8-11 years. Rottweiler Male Dog Names: Male Dog names are most often chosen to reflect favorite names of the owner or the strength, size, coloring and country of origin of the Rottweiler breed. To give you some inspiration regarding good male Rottweiler names our small selection might be of help with naming boy dogs. Our top male Rottweiler dog names are: Yoda *** Luca *** Konrad *** Hendrik *** Zeke *** Ludwig *** Moritz *** Nico *** Lukas *** Tank. Rottweiler Female Dog Names: Female Dog names tend to be softer, prettier and reflect the temperament of the Rottweiler girl dog. Our top choice of good female Rottweiler names are Leonie *** Jasmin *** Sabrina *** Pia *** Salsa *** Kim *** Piper *** Prada *** Anni *** Mara.